So Dan Dub passed on the Deerfield line of products to us, a line of sodas available at Walgreens which contain no HFCS, and that's always a good thing. Unfortunately I can't say the same for this root beer. At the start the flavor is pretty average. Then comes the subtle hint of beer, actual beer. My first reaction, as with any strange taste in a soda, is to try it again. Yep, beer, or at least some sort of fermentation. Next I check the expiration date. Still nine months till it expires. Quite unusual. Honestly even if that taste wasn't there this wouldn't get anything beyond buy a bottle, which is about $2.00 per. 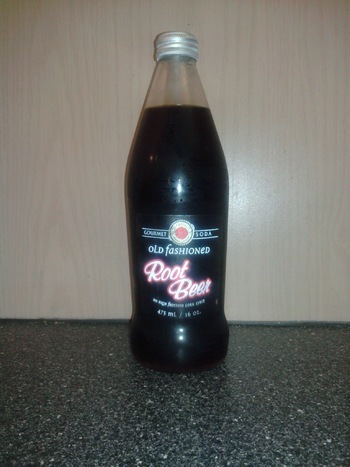 It's average, and there is stuff out there like Jones which you can get much more for your money, which is surprising since this is a generic root beer from a Walgreens. The aftertaste kills the whole experience, and because of that it drops a rank.